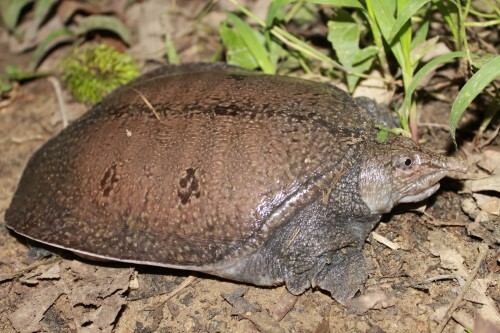 Forest Soft-shell Turtle (Dogania subplana) or Labi-labi hutan or Bulus hutan (local name in Indonesia), is an elusive species of clear, fast-flowing streams and quiet muddy backwaters. Lying partly submerged in the substrate, the distinctive patterning helps in its camouflage. 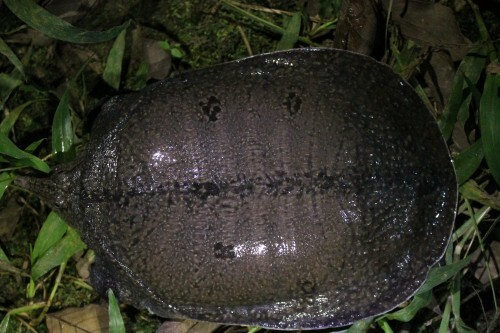 However, the pairs of eyespots or ocelli on the carapace tend to stand out. The neck is long : the upper surface bears longitudinal stripes and the underside is orange in colour. The head is relatively large and the nose tubular in shape, contributing to its charming appearance. The forefeet are greenish. The species ranges from Kalimantan, Sumatra, the Natuna Islands, Java. Can grow up to carapace length about 35 cm. Local people often eat this species. This species is listed in IUCN as Least Concern.